Scavenging for plastics and other recyclable items at the city dump is a grim reality of life for many children in Filipino communities. Most of the children at the dumpsites are malnourished. A few attend school off-and-on, while the rest do not attend school at all. The children work at the city dump to supplement their parents’ meager earnings. On a good day, a child typically earns about 75 cents, enough perhaps for the family to have a second meal that day. There are many individuals – the poorest of the poor – scavenging at dumpsites throughout the Philippines. This is a sad reflection of the severe financial and social conditions in a developing country, which lacks the resources to provide an adequate safety net for its destitute citizens. To their credit, the scavengers are dealing with their plight through hard work instead of resorting to begging or crime. In Tacloban, where VFV is located, the scavengers report each day to their work site – the city dump at the outskirts of the city – to eke out a living. The work force includes the children, some who have accompanied their parents and others who have come on their own. Volunteer for the Visayans initiated the Dumpsite Project in 2005, after learning of the magnitude of the problem. At that time, volunteers who visited the site were dismayed to see many children, some as young as five, working there, amid the stench of rotting material and oozing methane gas. The children appeared to be oblivious of the dangers. When a dump truck arrived, they joined the adults in rushing up to it. Some of the children clung to the side of the dump cab and took delight in riding it, as the front of the cab lifted up to slide the garbage out. Like other children in the Philippines, the children were playful. This was their playground; this was the only life they knew. When the project was initiated, VFV first surveyed the people at the dumpsite to gain an understanding of their backgrounds and their needs. VFV collaborated with governmental offices at the local and provincial levels and together worked to address this complex, multi-faceted problem. 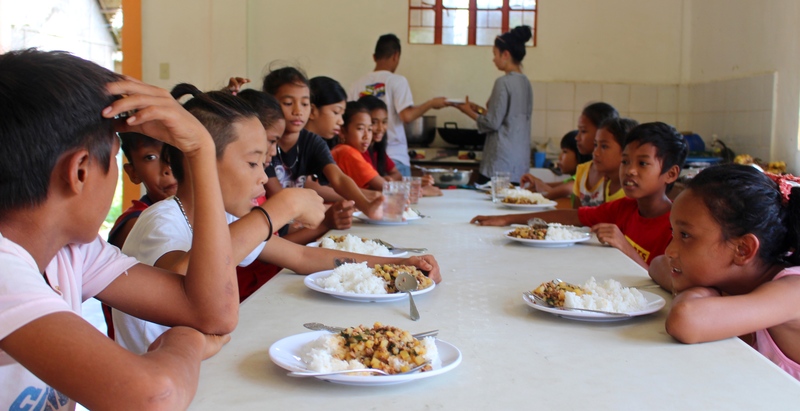 It was clear that just providing meals to those at the dumpsite would not be enough. VFV has continued to work collaboratively with the local governmental council and the Philippines Department of Labor and Employment on various initiatives. The physical environment has improved somewhat as the national government now requires that the garbage mound be less steep, that the refuse be compacted, and that the fill be covered with a thin layer of dirt at intervals. These regulations were adopted after over 300 persons were killed in a landslide of garbage at a Manila area dumpsite. The goal of our Dumpsite Project is to draw children away from the dumpsite and enroll them in school. VFV does this by providing incentives – food subsidies, clothing, school supplies, and weekly meals. VFV also monitors the children’s health and academic progress, and works with their parents to strengthen family functioning. On an ongoing basis, VFV provides enrichment activities, such as awareness sessions, art sessions, and games. This year, VFV plans to provide recreational and educational programs during school break (April to June). There is no governmental funding available for any of VFV’s programs. Currently, the Dumpsite Project operates on donations received from its international volunteers (who work at VFV’s various project sites), and a few international donors. The Dumpsite Project has accomplished a lot since it started in 2005. So far fifty-six children have left the dumpsite and enrolled in school. Fifteen were honor roll students, and two have just graduated from high school. All of the children have made major gains in health and social competence. 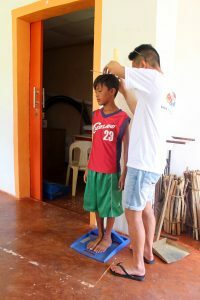 Aside from this, with pending support from former international volunteers, VFV is now helping to provide even more services for children working or previously scavenging inside Tacloban City garbage dump. In December 2011,with the help of the GoAbroad Foundation and Causes we finally completed construction of their community centre building in barangay Sto. Niño, Tacloban City. This was a much welcomed step forward for the staff at VFV who for the previous six years had spent the majority of their time conducting meetings in temporary locations, such as beneath bus shelters or within abandoned classroom buildings. With this new community centre comes new hope for the Dumpsite Project as well as for the community of Sto. Niño. The centre will not only serve as a meeting point for children on the Dumpsite Project but will also serve as an outreach centre for the local community from which sustainable community based initiatives can be nurtured. This is VFV’s vision: That one day soon, there will not be a single child laboring at the dumpsite; that all of the children will be in good health – physically and emotionally; and that all of the children will all do well in school. These are the changes that need to happen to prevent the children from being the next generation in the cycle of poverty. Want to help out? Why not donate or consider volunteering abroad with the Dumpsite Children.